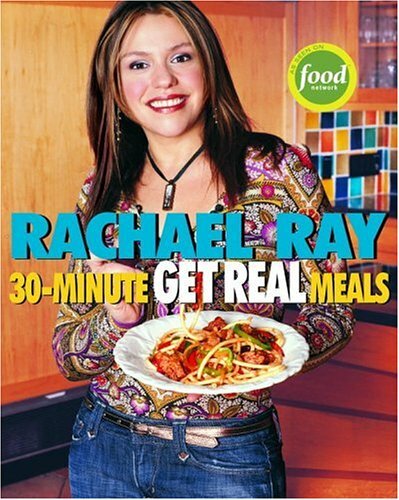 30-Minute Get Real Meals by Ray, Rachael: ClarKSON POTTER, New York 9781400082537 Soft Cover, First Edition., Signed by Author(s) - Vagabond Books, A.B.A.A. No pasta? No dessert? No way! Everything in moderation, says Rachael Ray. After all, some days only chocolate or spaghetti will hit the spot.<br /><br />In <i>Rachael Ray&#x2019;s 30-Minute Get Real Meals</i>, the bestselling cookbook author and Food Network star serves up another helping of creative, hassle-free recipes that are ready to rock your tastebuds in less than thirty minutes. The latest addition to Rachael&#x2019;s runaway hit series of 30-Minute Meals cookbooks is designed for cooks who want to look and feel great but long for the fun and the flavor that&#x2019;s missing from their extreme low-carb meals. Why fill your shopping cart and your stomach with processed, low-carb cereals and breads that taste like cardboard when you can eat the foods you crave? Here, at last, are recipes for those who just cannot and will not live totally carb-free: Pasta dinners made mostly with proteins and vegetables and only a couple of ounces of pasta per servings, fresh Thai and Mexican lettuce wraps, take-out-style stir-frys, and tons of burger ideas&#x2014;with and without the buns. And when you&#x2019;ve just got to satisfy that sweet tooth, even nonbakers (like Rachael) will flip for Nutty Creamsicle Pie, Stuffed Roasted Strawberries, and other surprisingly easy dessert recipes.<br /><br />With more than 150 new dishes, plenty of time-saving tips, and a generous serving of Rachael's &#x201c;you can do it&#x201d; attitude, <i>30-Minute Get Real Meals</i> proves you don&#x2019;t have to go to extremes to eat healthy.<br /><br />Rachael Ray confesses that there&#x2019;s pasta in her pantry, and she isn&#x2019;t afraid to admit that chili is just an excuse to snack on corn chips. On the other hand, she also confesses that it&#x2019;s more fun to shop for clothes when she&#x2019;s eating fewer carbs. So what&#x2019;s a carb-frustrated cook to do these days? Don&#x2019;t go to extremes, says the force of nature behind Food Network&#x2019;s <i>30-Minute Meals</i>. Get real! With a little creativity and less than half an hour, now you can watch your carbs and eat them, too. Satisfy your carb-starved cravings and still mind that waistline with more than 150 healthy, delicious recipes&#x2014;including Rachael&#x2019;s first-ever section devoted just to desserts:<br /><br />&middot;Snacks and Super-Supper Snacks<br /><br />&middot;Burgers Gone Wild<br /><br />&middot;Take a Dip: Fondues<br /><br />&middot;Salads that Stack Up<br /><br />&middot;That&#x2019;s Souper<br /><br />&middot;Well-Rounded Square Meals<br /><br />&middot;Pasta: Come Home Again<br /><br />&middot;Desserts? Yes, Desserts! Rachael Ray appears daily on the Food Network as host of <i>30-Minute Meals</i>, <i>$40 a Day</i>, and <i>Inside Dish</i>. She is the author of eight bestselling cookbooks, most recently <i>Cooking Rocks!</i> and <i>Cooking &#x2018;Round the Clock</i>. Rachael lives in the Adirondacks.